Israel based Teva Pharmaceuticals will cut as much as 25% of its Israeli workforce where it currently has more than 6,850 employees. At the same time, a few thousand other jobs for people working in the U.S. will also be cut, said Calcalist a financial news site on Thursday. The largest maker of generic drugs in the world will send out termination letters to between 10% and 15% of its more than 10,000 workers in the U.S. over the upcoming weeks, said the report citing those familiar with this situation. The new CEO at Teva Kare Schultz has been working on the details for the jobs cuts with regional management in both the U.S. and Israel, with Calcalist adding that those that will be given walking papers included its CSO or chief scientific officer, as well as the research and development president Michael Hayden. A Teva spokesperson would no comment about the report when asked. 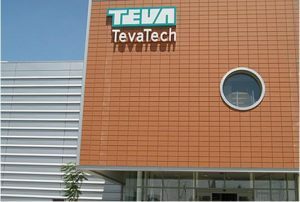 The Histadrut labor federation, in response to his report said it would not accept unilateral moves by the management of Teva. A spokesperson for Histadrut, Yaniv Levi insisted that any efficiency measure, if and when one arises, will be carried out through negotiations and with agreement of Histadrut and labor unions, as lay-offs will only be the last resort. Shares of Teva were down 2.9% in Thursday afternoon trading in New York. Teva is expected by most to implement a program for cost cutting following publication of its results for the third quarter earlier in November. The company announced that it would miss profit forecasts for 2017 due to dropping prices for generics across the U.S. market as well as weakening sales for its drug Copaxone for multiple sclerosis. Carrying close to $35 billion of debt following its acquisition Actavis for $40.5 billion the generic drug business of Allergan last year, investors have pushed Teva to clarify its future. Schultz said during a talk with analysts about earnings that it was absolutely a priority for him that Teva stabilizes its cash flow and operating profit to improve its financial profile. Interim CFO Mike McClelland added during the post-earnings conference call that Teva was working on a plan for 2018 and evaluating all its options. Teva has sold off assets of late to help meet debt obligations. Fitch Ratings earlier this month downgraded debt at Teva to junk.